The state-run Korea Trade-Investment Promotion Agency (Kotra) predicted the nation’s export growth would slow down in the first quarter of this year due to the possibility of prolonged trade conflicts between the US and China and growing uncertainties in Europe in the wake of Brexit. 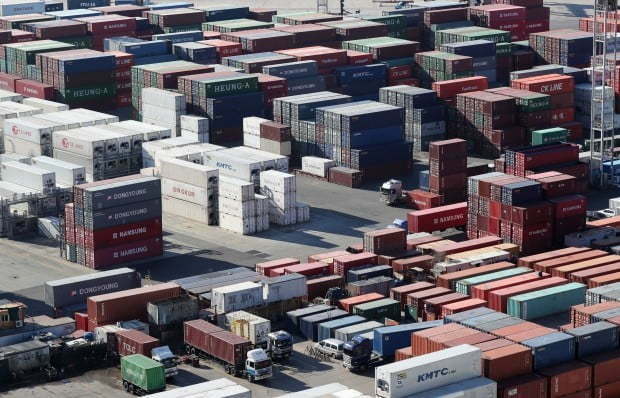 Kotra said Wednesday the nation’s export leading indicator dropped 5.5 points to 52.1 points in the first quarter of this year from the previous quarter, based on a survey done on around 2,200 foreign buyers and expatriate workers last month. The export leading indicator is an index to predict the nation’s export economy based on orders of foreign buyers and workers. An indicator over 50 points means an upswing in exports while the index showing below 50 points displays a slump in exports. By region, most indices fell except for Central and South America. Particularly, Korea’s major export destinations, China (49.2) and Japan (49.4), saw drops of 10 points and 2 points, respectively, to go below 50 points. Although the indicators for North America (61.1), Europe (57) and the Commonwealth of Independent States (54.8) are above average, they fell 3 points, 3.2 points and 6.2 points, respectively. By product, the outlook for Korea’s traditional export drivers is not bright. The index for home appliances (40.9) and chips (46.3) significantly dropped by 39.5 points and 19.6 points. Automobiles (29.4) and steel (47.3) also dropped by 19.5 points and 2.4 points. “Although Korea’s exports hit a record-high of $600 billion for the first time in 2018, the export growth of this year is predicted to weaken due to the possibility of a global economic slowdown,” said Lee Min-ho of Kotra’s trade base division. “In order to boost Korean firms’ competitiveness in the difficult export environment, we need to sophisticate exports with new promising industries, such as energy, future cars, bio and health,” he added.